Upon issuance, all SSL digital certificates have a finite lifespan and are no longer recognized as valid upon expiration. Certificates may have varying periods of validity and are often set to expire anywhere between one and five years based on company policy and/or cost considerations. Minimally, certificates need to be replaced at the end of their life to avoid service disruption and decreased security. However, there may be a number of scenarios where a certificate needs to be replaced earlier (e.g., Heartbleed bug, SHA-1 end?of-life migration, company mergers, change in company policy). 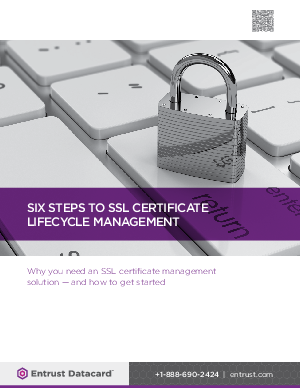 Given the finite lifespan of SSL certificates and their widespread use throughout an organization, there are numerous reasons to take a lifecycle management approach. It’s critical to maintain an accurate accounting of SSL certificates that doesn’t rely on manual processes and tools.